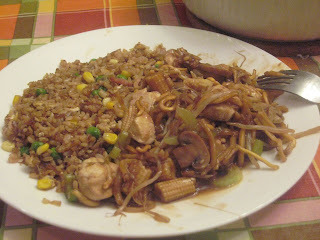 So tonight was Fried Rice and Easy Chow Mein! 1. If you think of it a head of time cook the rice the night or two before. After cooking it try to leave out with a lid off while it is cooling down to dry out the rice. 2. Melt the butter in the oil a medium or large non-stick pan over medium heat. Add the sliced green onion and diced white onion. Cook until the white onion is soft. 3. 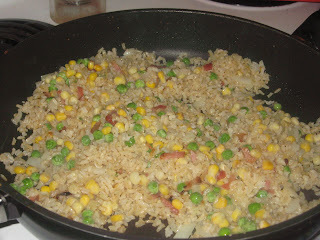 Add the rice to the pan and cook until golden brown. 4. Add the frozen veggies (and meat if you choose), Soya Sauce and steam for 2 minutes. 5. Beat the egg in a container with salt and pepper. Pile the rice in the center of the Pan and then stir in the egg. Make sure that you stir the rice while adding the egg otherwise you will have scrambled egg. 1. In a 10-cup Microwave Safe Dish dilute the cornstarch in Soy Sauce and the juice from the can of mushrooms. 2. Add all of the remaining ingredients into the dish. 3. Microwave for 10-12 minutes. YUM. What a great meal. Reading your blog makes me hungry. Wonder why.